This analysis is based on 189,904 computers scanned at PC Pitstop from April to June 2010. The scans were done either through our #1 selling product, PC Matic, or through PC Tune Up, which is a white label version of PC Matic made for our partner, CA. The products have been translated into Italian, Spanish, French, Portuguese, German and of course English. That said, the primary markets are English, Japanese and German and the sample is skewed towards those markets. The scans determine the location of the computer through the locale field which is used by Windows to determine the time and the daylight savings configuration. There are certainly flaws in this methodology. For example, a German laptop could travel to the United States and the user does NOT adjust the locale to the United States while running a scan. Best we can tell, this is a minor impact on the accuracy of the data set. The security information is based on CA’s signature file which is integrated into both PC Matic and PC Tune Up. For the purpose of brevity, we grouped the countries of the world into regions. A few caveats. New Zealand is grouped with the Australia data. South Africa and Russia were combined into the Europe data set. First we looked at real time protection. Our analysis checks to see whether real time security protection had been enabled at the time of the scan. If a security product had been installed but not enabled, they are not included. Congratulations to Australia and New Zealand for having the securest computers on earth! On the other hand, computers in Asia were the least protected. A full third of Asian computers had no form of active protection on their systems. Rogue security software is defined as software that pretends to be a security solution. The computer displays bogus security warnings. These warnings can only be deactivated by buying the rogue software. They do remove the bogus warnings but they do nothing to protect against real security threats. A whopping one out of five computers in Asia have this type of threat. 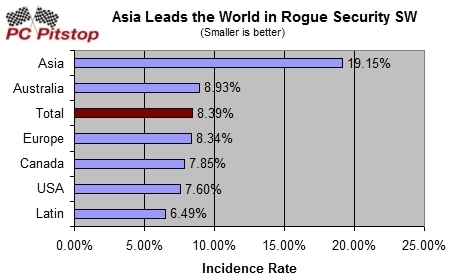 Our friends in Latin America have the lowest incidence of rogue security software. About 6-7 years ago, spyware was truly an epidemic. Spyware is defined as software that surreptitiously installs with the express purpose of monitoring system activity for the purpose of displaying annoying pop up advertising. During its hey day, many computers became unusable as the computer was deluged with pop up advertising. As we previouly reported, the incidence and severity of spyware has declined since its peak in 2004. Unfortunately, spyware still is prevalent throughout the world. 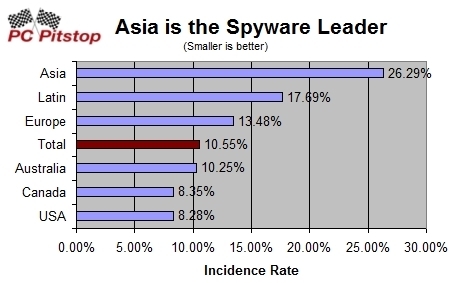 Asia again leads the pack on spyware. Perhaps, there is a connection between the higher incidence rates of spyware and the lack of real protection on Asian computers. The lowest incidence of spyware is the United States of America. Perhaps the scariest category of security threats is key loggers. As the name suggests, key loggers is tracking every activity on the computer and then storing and transmitting that information. Key loggers can be used by employers to spy on their employees, government espionage agencies, and jealous spouses. The worst case scenario are the shady underground of the internet that are harvesting credit card and other personal information for the purposes of black mail or identity theft. 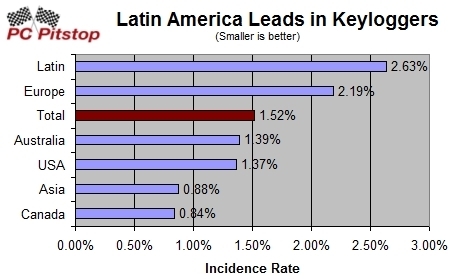 Keyloggers are most prevalent in Latin America and the least common in Canadian computers. Viruses are the nasty software designed to do harm to your computer. Historically, viruses were written by misguided computer programmers trying to wreak havoc on the world’s computers. It takes a certain type of savant to write these nasty programs. Additionally, viruses are typically the most difficult to detect and sometimes close to impossible to remove. We’ve all had the friend that had to reformat their entire computer due to an advised virus download. 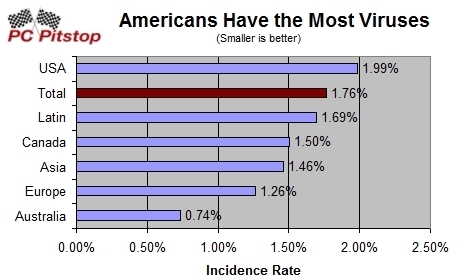 It was a shock to see that the US had the highest incidence of virus in the world. 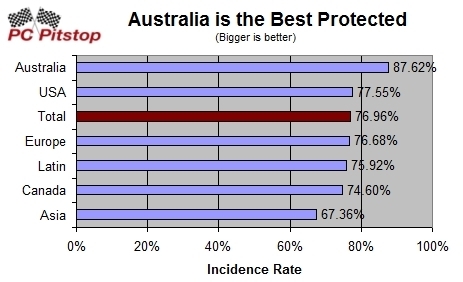 Our Aussie friends can feel the safest with the lowest incidence of viruses. They must be doing something right. 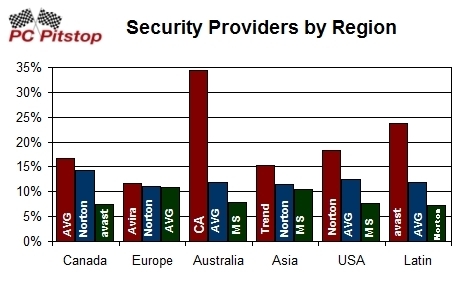 Lastly, we looked at the top security providers for each region. First a disclaimer. CA is our partner and they have a fairly strong presence in Australia which is certainly skewing the Australian result. The players do change from market to market, but a few key trends are emerging. Among the free players, Microsoft Security Essential and AVG are establishing world wide lead over the other players. No matter what market we analyzed, Norton by Symantec was a key player. We hope you enjoyed this latest report. 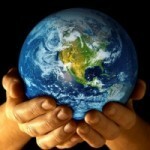 There are certainly differences between all the regions of the world. The one overarching conclusion is that security is a global issue. There is no corner of the earth that can escape the reach of the makers of badware. For our next report, we plan to analyze user demographics against security threats. Hopefully we can get some insight into whether males are more careless than females. And also, whether our seniors are more savvy than the younger generation at protecting against threats. Thanks for reading, and give us your ideas and comments below. The Pit Blog computer, PC Pitstop, protection, purpose, region, rob cheng, signature file, types of security threats. permalink. What is interesting about this article is the Latin thing, the least amount of rouge software incidence, but the most key loggers, now I would think that a key logger app. would be right at the top of rouge software stats, true there not designed to be Security software per-say but they are not either , to protect your system, I mean if you think about it, why would you need rouge software if you already have a way to get to the files on a system, that is what a key logger will do for you, give you passwords and or anything you type, from a web address, to an email, to a note pad .txt. so whats the need for rouge software other that to take over someone Else’s computer and use there resources for malicious deed’s. I tend to agree with Al, Lockport IL, not only agree, but I think he hit the nail on the head. Over the last 30+ years repairing parasite (= all viruses) infected PC’s, time and time again I have seen the convenient discovery of one or another Anti-Virus or the like publisher come up with a fix within hours, sometimes minutes, of the discovery of a newly released parasite. I agree, it is one of, if not, the biggest scams and protection rackets imposed on the Internet Users knowing that Microsoft has the ability to alter the Operating System codes to prevent this, yet they themselves are involved in this protection racket or, I believe, have shares in the Publishers of these Security type programs, if not why not fix it ?? As MAC’s are becoming more popular now, we discover that in one of the latest updates to the 10.5 MAC OS range, they have included Trojan protection codes – MAC users is yet an untapped market for selling Security programs !! To top it all of, none of these give you or are they capable of providing the PC User with 100% protection against Parasites and Hackers. This “Anti- anything” and “Internet Security Suite” publishing is indeed a swindle of the greatest proportion and makes Scammers and Hackers look like Toddlers in a Kindergarten. I think the security threats comes from the makers of the anti virus software themselves and need to garner more business as I’ve seen with the Iolo scam to hook you for 1 year with advanced security for additional $199.99 a year fee. Some guy from India comes on as a computer geek squad member and won’t let you off the hook with all the hype. On one computer I had a Anti virus 2010 hit with the green screen telling me I’m infected and then Kapersky pops up saying it would get rid of all the listed virus;s Trojans, worms and every other thing you can think of. Now,how convenient was that? It’s all a scam!